26969 Private John Robinson, 14th Battalion, the Durham Light Infantry died of wounds 7 October 1915. He was 26 years old and is buried at Etaples Military Cemetery, France and is commemorated on the St. Helen’s Colliery Memorial Cottages. Training took place at Aylesbury, Halton Park, High Wycombe and Witley Camp. The battalion landed at Boulogne 11 September 1915 and the 64th Brigade was soon heavily involved in action at the Battle of Loo, 25 September – 8 October. At 1.00am 26 September, the 14/DLI and 15/DLI passed the old British front line and at 2.00am reached the old German front line north of the mining town of Loos. 14/DLI was selected to reinforce the 63rd Brigade which was facing a hostile German counter attack in Chalk Pit Wood. By 10.30, the advance was under considerable shell and machine gun fire and a general advance was ordered at 11.00am. The Durhams suffered from heavy enfilade machine gun fire from Chalk Pit Wood. The position of the 64th Brigade was subject to intense shell fire and the bombardment continued until dusk. They were relieved in the early morning of the 27th. Losses in the ranks amounted to 277 and 450, 14/DLI and 15/DLI respectively. 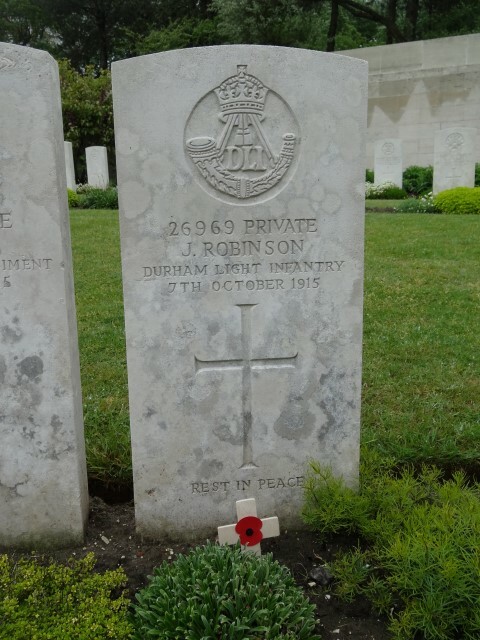 Private Jack Robinson was one of the casualties. He died of wounds at 7.45pm 7 October 1915 in O.C. 1 the Canadian General Hospital, Etaples. He had suffered gunshot wounds (GSW) to the thigh and leg. 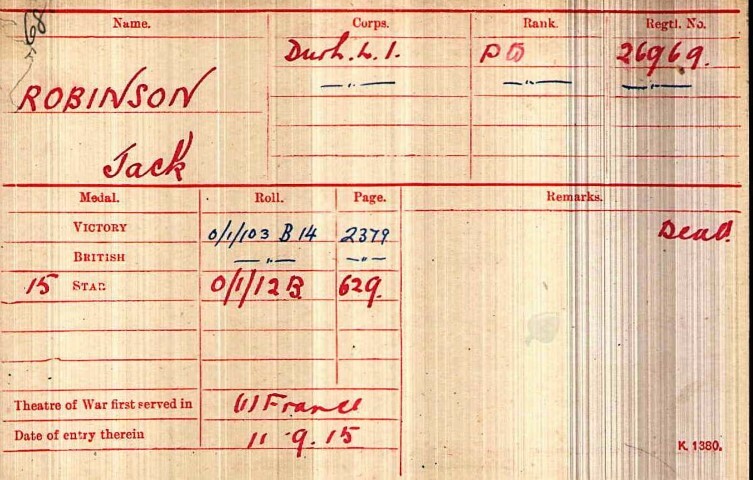 Private Jack Robinson served a total of 1 year 30 days, 27 days in France. He was awarded the 1914-15 Star, the British War and Victory medals. The inscription was provided by his mother, his father having died. The cemetery register records Mrs. Robinson’s christian name as Julia. The 1901 and 1911 census details record it as Judith.